From her Ready-to-Wear collections, to assortment of shoes, handbags, and new line of jewelry, Tory Burch has flawlessly established a sophisticated, stylish lifestyle brand in four short years. She continues to mix ethnic details, bold colors and graphic prints with timeless pieces. 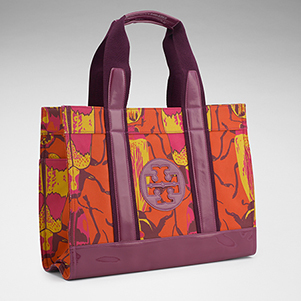 The Pink Beetle canvas Tory Burch 'Tory' Print Tote trimmed in patent leather is one of two new prints. The combination of yellow, orange and purple brings memories of leaves turning as the season changes, making it the perfect accessory for fall.